The continued dominance of the doctrines of Political Correctness and Multiculturalism depends on a set of unexamined premises. If the axioms underlying PC/MC were ever carefully examined by a large proportion of the populace, the entire political superstructure of the West would collapse. The practitioners of the Multicultural Arts are at least subliminally aware that the basic assumptions of their dogma cannot stand up to close scrutiny. This is why the proponents of PC/MC tend to respond to reasonable criticism with accusations of “racism”, vicious ad-hominem attacks, and physical violence. They fear that the edifice in which they have invested so much emotional and physical energy may in fact be spun from pure gossamer. Fear generates anger, and their fury demands the destruction of those who would expose their delusions. Where is the evidence for this assertion? In what ways was Britain unsuccessful while it was still, well, British? In what ways is it more successful now? None of these questions is asked by any significant public figure, because the axioms of Multiculturalism must not be questioned. They wouldn’t axioms if they were open to debate. Immigration is good for the country, and that’s that. It’s true because Tony Blairs says so. Tony Blair has defended Labour’s controversial mass immigration policy by claiming that Britain cannot succeed unless it opens its borders to more people from different backgrounds. The former prime minister said it was ‘right’ that the country was made up of different cultures and faiths mixing together. Let’s continue our questioning of these unexamined premises. In what sense is it “right” to mix cultures? By whose standards? Mr Blair added that migrants had made Britain ‘stronger’ and said those calling for greater curbs on foreigners entering the country were wrong. Really? In what way is Britain stronger now than it was before it admitted all those immigrants? From an outsider’s viewpoint it looks much weaker and more fragmented than it ever has before. His comments come just days after official figures revealed that the population is expected to soar by the equivalent of a city the size of Leeds every year for the next decade. Once again, what evidence is there that mass immigration is a “positive thing”? What studies can you cite? Where are the statistics? Do unbiased surveys of public opinion agree with you? Under Labour, up to 5.5million people born outside the UK arrived as long-term migrants. Between 1997 and 2010, around 2.3million left the country, meaning the UK population increased by around 3.2million as a direct result of foreign migrants. In an interview with Eastern Eye newspaper, Mr Blair said: ‘The vision of a country of different cultures and different faiths mixing together is the right one. The people who “do well” under recent British immigration policies are those foreigners who live lavishly on social benefits, along with their multiple wives and numerous children. But what about the average hard-working British taxpayer? How well is he doing? Mr Blair added that the anti-immigration debate was one of the ‘past’. ‘I think the majority of people in Britain today are not prejudiced and can understand the benefits of migration. In other words: if your criticism has been leveled by somebody else in the past, it has no validity. Why is that? Why does an argument become invalid simply because it has been made more than once? Fellow Tory MP Dominic Raab added: ‘These comments are naïve if not reckless. Tony Blair has left Britain with a legacy of uncontrolled immigration that has put huge pressure on public services and undermined community cohesion’. Ah, but Multiculturalism guarantees that there will never be any “community cohesion”. The phrase is a euphemism for “a lack of interracial and intercommunal violence”. “Community cohesion” means no honor killings, no grooming and pimping, no ethnic gangs, no citizens getting beat up for being white or Christian. Britain will not attain that exalted state again for the foreseeable future. From Multiculturalism’s point of view, an absence of “community cohesion” is not a bug — it’s a feature. It’s a good idea to subject the premises of PC/MC to close scrutiny. None of them can stand up to a real forensic examination. Let’s keep doing it. Fear and the herd mentality are the only things that hold this Palace of Folly together. England is reaping the slightly less savoury fruits of post-war political Americanism, i.e. bipartisan progressivism. If it's so 'right' then why isn't Mr blair, in his role as Middle East Envoy (or whatever grand title he has assumed) advocated and used his influence to introduce a multi-cultural and multi-faith change in all the arab and muslim countries where he does his business? And if it isn't 'right' for them, why can't we have our own white, Christian, English country back to how it was before the socialists got their dirty hands on it and proceeded to destroy it from within? City schools are now minority English, yet the surge in immigration and high immigrant birth rates require many more new schools to be built over the next 10 years at a cost of £100 Billion. This money simply does not exist. The Income Tax take over 2008 was £140 Billion, the Welfare payment cost over that same period was £154 Billion. Of course, the stealth taxes on top of Income Tax covers the difference, but last years deficit between money raised in tax and money spent was £160 Billion. If all new immigrants are contributing to a tax surplus over and above the cost of housing, feeding, educating and tending to their health, then all is well and good. If, however, they are a net cost to the state, then Britain is finished, and the situation can only become worse. And I think most people are aware that they are indeed a cost, including Blair and his ilk. The worse thing that could happen to a bankrupt Socialist state is to become a full Communist state - at least in the eyes of a Conservative. To a Communist, ex-Communist or a Communist sympathiser, it is the exact opposite of course. In fact it is what those ideologues have been aiming at for decades, and not co-incidentally, Blair's government and his supporters in the Trades Unions were/are riddled with Communist sympathisers. We are entering revolutionary times. PS: A quite magnificent article Baron! "The Income Tax take over 2008 was £140 Billion, the Welfare payment cost over that same period was £154 Billion. We are entering revolutionary times." Tony BLiar is a strange creature. The former British prime minister has sold his political and economic expertise to Kuwait and the United Arab Emirates, via his fledgling private consultancy. He also represents the investment bank JPMorgan in the region. "Fledgling" means he made some 36 million pounds in the last two years. 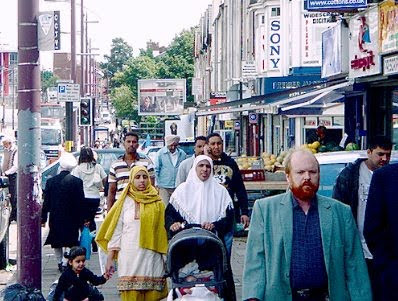 If multiculturalism were so popular amongst Britain's people then wouldn't the most multicultural areas of the country be the most desirable to live in? Shouldn't we be witnessing a mass migration of people from more "monocultural" (i.e. traditionally British) areas to more multicultural areas? Shouldn't monocultural areas be emptying as their jealous residents flock to multicultural areas? Therefore shouldn't property prices be plummeting in monocultural areas as demand drops? None of the above is happening. Property prices in traditional British areas are holding up well. People are not abandoning such areas. Multicultural areas are home to fewer and fewer indigenous Britons. I wonder if Tony Blair can explain the paradox? Smashing social coherence has been the motive behind this mass immigration from incongruent third world cultures. Islam is a perfect tool for post-democratic progressives to keep the natives timid and passive; especially when the secular religion of leftism is not as effective as traditional religion used to be in the past. And Marxism has always understood that it is neccessary to scatter the populace and destroy it's selfreliance, in order to render the state supreme. Immigration was simply used to break up the old order, in order to bring in the new. Our elites have purposely plotted and schemed to destroy us. The modern left is truly inexplicable ... mass immigration should be ideologically anathema to any proper Labourite because it brings in hordes of foreign workers who will put native workers out of their jobs because they work longer and for less. That was the tune of the Australian Labor Party pretty well up until Gough Whitlam in the 70s. It was the Labor Party who were still staunchly championing the ‘white Australia policy’ into the late 1960s after the Liberal Party (conservatives) had, for all intents and purposes, already abandoned it. Does this just go to show that modern trade unions and Labour parties are comprised almost universally of bourgeois chardonnay socialists who fancy themselves to be standing in solidarity with the proletariat but really are hopelessly disconnected from the common folk? Must Catholics Make Room for Muslims? Who Are These Soldiers of Allah? Again: What Kind of Deal is This? What Kind of a Deal is This? Does Turkey Threaten European Security?